Maintaining this blog has been of some minor concern of late, you will have noticed that entries have become rather sparse over the last few months. This is not because I have become weary of the concept of regular writing but rather my mind has been taken up with other matters the past six months making it very difficult to screw-on my writing head. I have decided I must make an attempt to write at least one tale a month to keep my regular readers and followers interested and to let you know I’m still around. Yesterday my brother, his wife and I took Mum on a stroll down memory lane and after taking in the air on the promenade we wandered around Coney Beach fairground in Porthcawl. It must be twenty or more years since I last visited the fairground and it was interesting to see how many of the rides from the 1950s and 60s were still popular interspersed with some rather scary-looking modern rides. The noise has changed however, or I must be getting old, every ride had a different tune blasting out of distorting speakers, well, I say tune but most of it was just annoying. I have to say though that I was quite overcome with memories and felt just a little envious whilst I watched all the teenagers and young persons who have a whole life ahead of them experiencing all the rides I enjoyed when I was their age, and would loved to have turned back the clock for an hour or two, instead I wallowed in nostalgic memories. Here we see my brother Geoff on the left with myself on the right with our older cousin Barbara in the rear between us on a rather tame fairground ride in the mid to late 50s, I’m estimating about 1957. The photograph was a tiny 3″ x 2″ and I’m guessing the photographer was my uncle as I don’t have the negative. It’s scanned quite well considering the size of the original. One thing missing in the modern fairground are all those overhead wires, some of them look so low they could be touched. Back in the 1950s and 60s we always went to the fairground at Porthcawl at least once a year, usually on Whit Monday with the Sunday School outing. Although Porthcawl was only a few miles from Bridgend the church hired six or seven Western Welsh 44-seater buses and we all trooped off to Coney Beach. Leaving Bridgend at 9.30 the buses would wend their way to Porthcawl and disgorge their passengers who were free to do as they wished until lunchtime when all would congregate at the largest catering establishment for fish and chips and usually afters was something with thick custard. Photographs taken on our annual trip are quite rare so I was pleased to find this newspaper cutting from the mid 1950s showing the Sunday School and church members at lunchtime in the café. 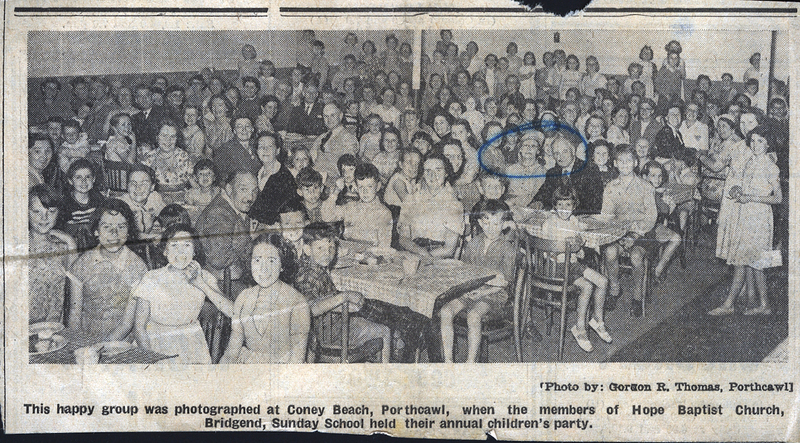 The couple circled in blue are my grandparents Stanley and Beatrice Simmonds. Stanley was the Sunday School Superintendent for many years on and off and was also the church organist for 57 years. On my flickr pages you’ll find a photograph of me on the beach in 1959 or 60, taken on the annual trip you’ll notice I’m wearing a shirt and tie. My final look into the past today is another photograph from either 1959 or 1960 and shows my mother and sister with me walking behind with a large scowl on my face. I guess I was not happy at being dragged away from that gorgeous-looking Leyland Atlantean seen in the background. Also interesting in this photo is the track of the Porthcawl Miniature Railway, of 15” gauge this railway ran along the eastern promenade for decades before closing in the late 1980s. Parts of the trackbed are still visible with sleepers in place. Sadly, for the first time for ages, I forgot to pick up a camera before we left the house, I usually have the little compact in my pocket, so can’t show you any modern-day views of the fairground, not that I’d have been wanting to take any photos in there mind! Always interesting to read your memories of childhood, Mike. It often feels like I was there with you.